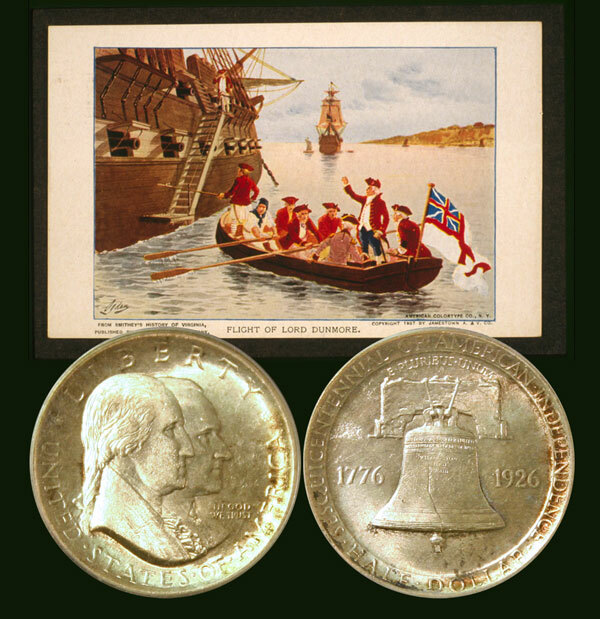 Today, the Sesquicentennial of American Independence Commemorative Silver Half Dollar Coin gives the highlights of Governor Dunmore’s removal of the gunpowder with the objective to disarm the revolution. The Royal Governor of Virginia had for some time been regarded with suspicion. His actions along the Ohio border were well remembered; and it was known that he had determined to oppress and overawe the colonists, and force them to submit to increasing demands made by the Crown. Dunmore knew the discontent engendered by the act of the British Parliament in 1764, taxing certain articles imported for American consumption, and disapproved by them. They regarding it as a tax without their consent. The Colonies grew indignant, but no act of rebellion occurred. Dunmore was preparing for any move made by the Virginians. In the following year when the celebrated Stamp Act was passed, a general revolt of the Americans was disclosed. Virginia in the most pronounced manner, declared her position through the Patrick Henry resolutions, which were supported with such fervor and zeal by the distinguished men who composed the General Assembly, that their adoption became a matter of warning to the British Crown. The people of Virginia were anxious to avoid a conflict, and seemed unwilling to declare any intention that could be construed into a desire to become independent of the mother government. England misconstrued this apparent loyalty; and believed that the Colonies through fear of chastisement and oppression, would never resort to arms to defend their rights. And, aside from this, the Royal Governors were loyal to the Crown, and could keep in subjection those who were inclined to rebel. Being thus deceived, England was led to commit the overt act, when her Parliament adopted the notorious Boston Port Bill, and prepared to enforce the collection of the tariff tax on the cargoes of tea then afloat in that harbor. Then it was that the fires of Rebellion were kindled in every hamlet. The Continental Congress in 1776, as it is well known, declared for Independence; and the call went out for volunteers to defend their action; and thus the old Valley was again drawn into a war that taxed their patriotism as well as their resources. How they responded will be shown later. We must follow the Virginia Governor; and see if he developed the infamous traits of character that Genl. Lewis and his followers had charged. Dunmore acting in concert with Genl. Gage, who was in command at Boston in the spring of 1775, by stratagem undertook to carry out the order sent him by Genl. Gage; and the reader need not be surprised that the trusted messenger was Connolly of the Dunmore War notoriety. The object was to secure all the gunpowder in the Virginia colony, and thus prevent the colonists from supplying the soldiers who might arise in rebellion; so that without ammunition, they could be suppressed. Accordingly, the Governor contrived to have several English war-ships in easy call. One was sent up York River and anchored near Williamsburg. On the 20th of April, 1775, Dunmore seized the powder. This was done in the night. The English ship’s captain with an army of soldiers marched from the landing over to Williamsburg and easily secured every keg of powder in the magazine and carried them to his ship. The next day, the Governor was openly charged with connection with the scheme; and to escape vengeance, answered that he feared an uprising of the slaves and was preparing for such an emergency. The people soon realized the extent of his dastardly work, and were aroused from mountain to sea. The volunteer companies hastened towards Williamsburg. Patrick Henry at the head of one body of men, boldly marched upon the Governor and offered him battle unless he returned the powder. To avoid a conflict, the Governor offered money in lieu of powder, which was accepted. He then had troops to land from the ships, to come and guard his palace. They were there for revenge; and the Governor, being a coward, fled from the scene of his recent perfidy and the palace where he had lived in regal splendor for years; and with his family hastened aboard one of the English ships, and with other ships that he gathered from the Chesapeake Bay, sailed into the Norfolk port, a town of about 7,000 people. From that point he sent messengers through the surrounding country, to urge the negroes to insurrection, and aid him to destroy the rebellious population. Many slaves joined his army. His wanton destruction of property and brutal treatment of helpless citizens revealed his true character. A battle was fought at a place called Great Bridge; and after a desperate fight, the English fell back to Norfolk. The Governor was compelled to seek shelter in his ships once more. The Virginians fired upon the ships. Dunmore then fired upon the town, which resulted in the total destruction of the beautiful little seaboard city. Dunmore then sailed away to become a terror to other towns along the Chesapeake. He once sailed up the Potomac as far as Mount Vernon. After several other battles with the Colonial troops along certain shores, he sailed away with his fleet, carrying much plunder, and, as has been said by several historians, took with him about one thousand of the poor deluded slaves and sold them to the West Indies’ planters. His case seems fully proven. His infamy and treachery to the Virginians was complete; and as already stated, the Old Dominion did what she could to obliterate his name from her records, leaving only enough to tell of his double dealing. Had Dunmore forsaken his Royal master and been true to the Virginia Colony, he would have been her largest land owner. He had procured grants of land in many sections for many thousand acres. He had five tracts in Hampshire County, viz. : 400 acres on both sides of North River and Great Ca-Capon; 229 on Little Capon, 100 on Short Mountain; 284 on drains of South Branch; 129 on South Branch on the Great Wagon Road. These tracts were regarded as vacant after the Revolutionary War, and titles given to actual settlers. The 400 acres, after frequent changes, finally became the property of John A. Smith of Capon Bridge in 1879. In one of the deeds from Fairfax, he says : “This is one of the tracts surveyed by George Washington,” lying on East side of North River. The Sesquicentennial of American Independence Commemorative Silver Half Dollar Coin shows with an artist’s image of Lord Dunmore escaping to a ship.